Have you ever sat for what seemed like hours, writing and rewriting, trying to communicate an idea, but you just feel… lost? You sit there thinking about it for awhile, becoming increasingly frustrated with yourself. Finally, you just walk away, trying to find some perspective, but when you come back, it seems like your ideas are even more muddled than before. What Is a Creative Spine? The idea of creating a skeleton for your writing is nothing new. The headline is the head, this sub heads are the arms and legs, and the paragraphs make up the bones, flesh, and everything else. It’s a good metaphor, one that describes the process of bringing an idea to life on the page. But what about the spine? 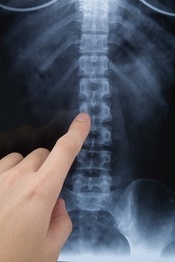 Our spine is probably the most important bone in our body. Without it, there is no movement, no sensation, no life. If you ever started writing and then suddenly felt paralyzed, it’s probably because you lost your creative spine. Let’s go through some examples to show you what I’m talking about. We’ve talked a lot about metaphors here at Copyblogger, and for good reason. If you can come up with the right metaphor to describe something that you readers are having trouble understanding, they are going to remember it (and love you for it) for a long, long time. But metaphors are also a great spine. If you’re feeling a little lost with your post, try inventing a metaphor to describe exactly what you’re talking about, and then wrap the entire blog post around it. Don’t try to be clever. Just figure out a way to describe something that gives your reader a different perspective. Have you looked at the Popular Posts in the sidebar of Copyblogger lately? Currently, my post, Why No One Reads Your Best Blog Posts (and What to Do about It) comes in first. I’d like to take credit for it, but really, the power comes from the Explanatory Spine. If you want a recipe for a great blog post, take a subject that vexes your readers and explain it. Unravel the mystery. Not only will you be helping your readers, but you’ll probably get lots of links from other bloggers that appreciate your insight. I’ve noticed that, whenever I have trouble writing about a topic, it’s usually when I’m trying to explain the nuances of how something works. It’s too theoretical, and I forget how to get from one point to another. Some writers I know call it “getting lost in your own head,” which is a perfect way of describing it. Have you been by Zen Habits lately? If anyone is a master of the Categorical Spine, it’s Leo. Almost all of his posts are structured as lists, rattling off one point after another until he’s finished with the idea. Leo is also one of the most prolific and popular writers on the web. It’s no coincidence. If you can structure your blog post into a series of points, you’ll find that writing is a lot easier. You no longer have to find a graceful transition from one idea to another. Coincidentally, most blog subscribers love list posts because they are easy to scan and pick up a few quick tips. Lists are the ultimate bite-sized content. Here’s another one of my personal favorites. Whenever I’m stuck for a good blog post idea, I just think of something that everyone believes that’s obviously wrong. Then I imagine I’m writing my blog post in response to that perspective. The contrast between the two ideas serves as the spine for the piece, and it makes it remarkably easy to write. Just to be clear, the point isn’t to stir up controversy; it’s to bring clarity to your ideas. By positioning yourself against an enemy, it becomes easier to map out what you really believe. If your post comes off as argumentative, consider going back to soften the tone. Nobody likes a blogger who’s always on their soap box. If it sounds like a lot of work… it is. Still, it’s worth every moment when you finally stumble onto your spine. Your words just fly onto the page and finishing the blog post is next to effortless. It’s not because you suddenly found your talent. It’s because you finally know exactly what you want to say. My little project has been going on for 8 months now and coming up with posts has been tough at times. This advice comes at just the right time. I’ve got several ideas but lacked ways to get them across. Thanks. I definitely get lost in my own head sometimes when writing posts. In fact, I’ve been very dissatisfied with my writing lately because it doesn’t seem to translate from what I’ve got in my head into anything that good on paper. If the “how to” doesn’t apply, I could also do a step-by-step of how X works. The argumentative spine works really well for me. List posts never have, although I think I can get better. If I have things to say in a list, I fill the space between the bullets with humor or humanity. Great post here. The prescriptive and categorical spines are great and ones that I’ll be focusing more of my writing on as it’ll help bring together my ideas when I do get stuck (which happens a lot). Thanks for the post. I’m always looking for a ideas for my next blog post. I may also use the topic of the spine and how most people block their energy flow by incorrect movement when practicing tai chi. Carries well into daily life too. Thanks for helping me with today’s post and for future ones as well. This is a great post. I would never have even thought as ‘writers block’ in the spine concept you thought about. I got writers block the other day and just couldn’t write any posts for the life of me…. Great post and the spine metaphor is an excellent way to succinctly bring together effective blog structures/formats. Thanks! This post couldn’t have come at a better time for me. One of my blogs was quite dead for some time because I just didn’t know what I wanted to write about on it anymore. I think my creativity spine was broken. Over the last week or two I’ve spent more time with it and it’s starting to come back. I’ll have to be sure to implement some of your tips on finding your spine, probably on a frequent basis. Solid skeletal structure and body mass on this post. Wonderful to read. Thank you. Been there many times. Most of time time, you can just walk away from the computer for a bit and come back to it fresh a little later. Your mindset has so much to do with this. How graceful to use Twyla Tharp. This post is pilates for writers Jon. Very very good core training. Have you been reading my mail? LOL, I’ve been evaluating my work lately and realized I need a little more “spine” of late. Thanks for the helpful post. I am not sure if I would consider myself a spineless blogger or not. I think I just am what I am and I go about just doing my blogging business. I don’t really worry about what I am or what I should be. I’m just myself and that is what works. The more genuine you are the more readers people seem to get. I think I use some of your methods intuitively, but reading your explanations has really helped to clarify my thoughts on *why* I do what I do when I’m blogging. Great article for writers/bloggers. Thank you. But more importantly, haven’t you also just told everyone about how to solve life’s problems in general? I’m an executive coach and truly believe you can use everything you just prescribed as a problem solving prescription. I often suggest to my clients that they use writing as a clearing tool. My practice is all about taking action and moving my clients forward. However, you can’t move someone forward until they’ve cleaned up their crap. Writing is a big part of that for a lot of people. I work with Executive Women, Entrepreneurs and folks who are trying to transition from Corporate Jobs to being entrepreneurs. Thanks for giving me a succinct tool to refer them to! I’ve been loved by clients/hated by competitors. This is something that will not change. My spine must! Thanks for giving me “spine” strength~more of a voice. now taking on a different meaning in my blogs because of your inspiration here. You’ll be remembered for your helping make this pivotal point. Just writing down anything always helps. Even if it is incoherent at first and has no “spine” eventually you will develop one and may be able to use it. Before you know if you’ll take a couple lines that don’t relate and suddenly realize there is a way to connect them all. This is an excellent post. I get writer’s block quite often, so when I am ‘on’ I end up writing quite a few articles. The next time I am dealing with this ‘creative direction loss’ I’ll have to try one of these. These are some great tips. I get so excited about writing that I am often all over the place. I was having a difficult time finding something meaningful to say yesterday, so I started journaling, and it actually led a pretty good post! This post just help me get my mojo back. I am always mad when I can not write anything down, now, I am back. Reading this post got me inspire to write again and follow your tips. I haven’t done a list in ages. Sometimes I can ramble too much and lists are a great way for me to keep to the point. Though I disagree that being argumentative is a bad thing. I quite like posts by people who are on their soap box, especially if they have a snarky witty tone to it. Your articles on writers block are great… it’s seemingly THE biggest issue in blogging. Great article. I like the idea of using metaphors. In the past I’ve searched for a list f metaphors on Google and not had much luck. Your article has inspired me to look again. Thanks for your helpful blog. I personally blog for expressing my thoughts to the outerworld. At the same time I like debating on certain important issues with other people. My main motive is to gain traffic and share our viewpoints. I am sure your blogging tips will add value to it. This post is so solid. I don’t have anything intelligent to add, just bookmarking it and really diving in to study it. Your pointers about finding an anchor really jolted me to attention. These elements can be trickier to pin down, as it’s about cutting through the ‘shoulds’, ‘musts’ and ‘oughts’ that buzz around your head and trust that your talent will solve the problem. Nice post… Everyone loves it because everyone can totally relates on the post.